When my creative juices start flowing, I can quickly become buried under bits and pieces of fabrics, notions, patterns, and cocktail napkin scrawls of my idea of the moment. I waste a good deal of time digging for a lost something-or-other, and don't find the look of messy work space particularly appealing. 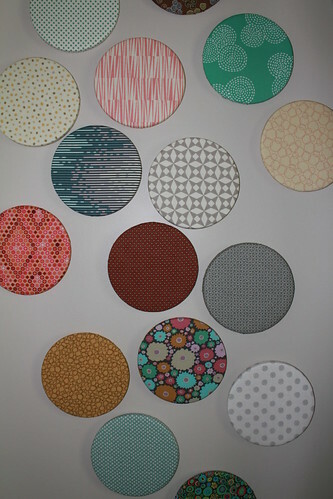 To help combat this problem, I've added a fabric covered cork board organization wall to my sewing room in hopes that it will assist me in cleaning up my act! No longer will I have excuses for keeping a messy, unorganized workspace that wastes precious sewing time! 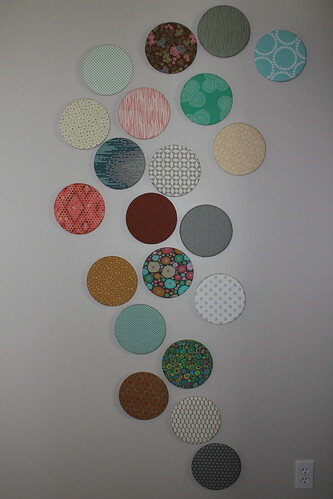 Step 1: First start by cutting your cover fabric approximately 1-1/4" larger than your cork board all the way around. 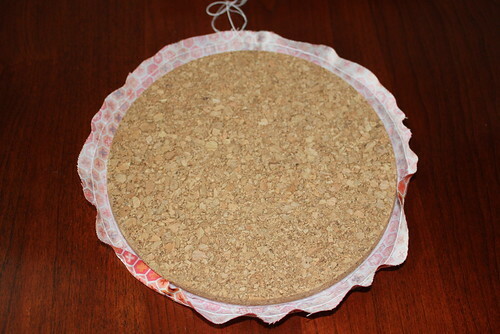 My cuts measured 9-1/2" in diameter for use with a 7" cork board. 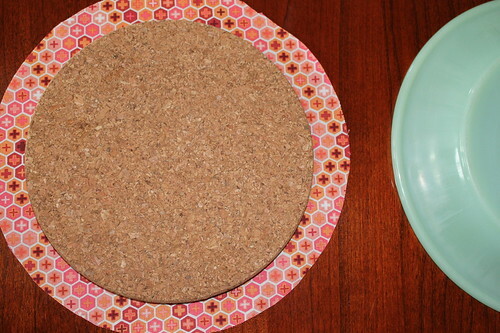 Fortunately, I had a dinner plate that I could use as a template. Step 2: Using standard weight top thread and heavy weight bobbin thread (I used button twine), sew completely around your fabric circle, about 1/4" from the edge, using a basting stitch. 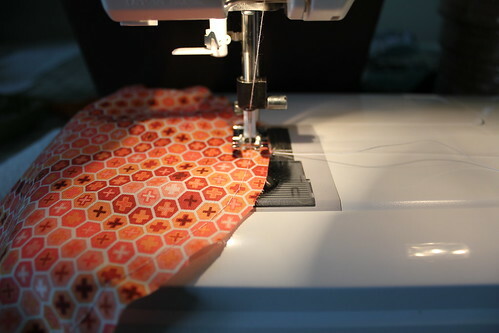 In this photo, I sewed with the right side of the fabric facing up. I have however, sewn some of my circles with the wrong side facing up, it didn't make a difference as to which side the bobbin thread was on. Step 3: This is step is optional however, since I wanted a little softness for my boards, I added a circle of cotton batting to the assembly. 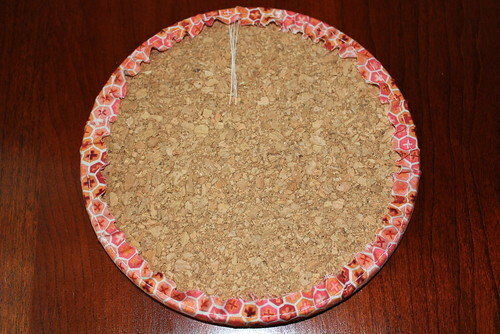 If you choose to do this, cut the batting circle the same diameter as your cork board. 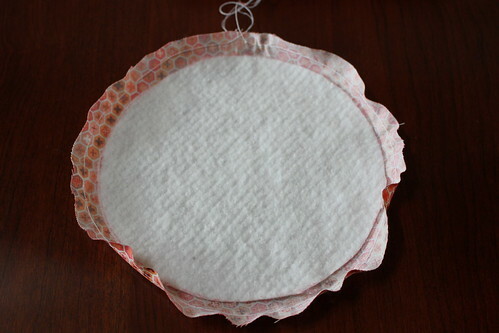 Lay your cover fabric circle right side down and place the batting circle exactly in the center of it. 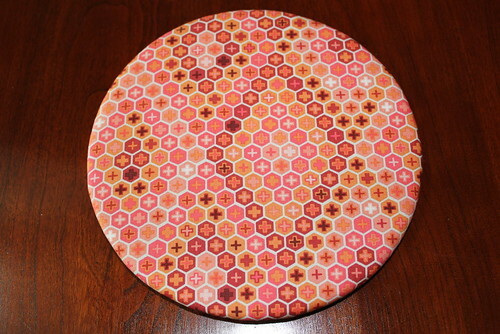 Step 4: Place your cork board exactly in the center of your fabric/batting assembly. 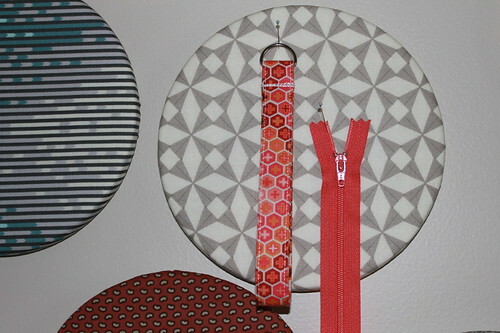 Step 5: Gently pull the heavier bobbin threads until the fabric is tightly gathered around your cork board. Be sure to evenly distribute the gathers. Securely tie off both the bobbin and top threads and trim them. Step 6: You may encounter a few edge wrinkles like the one shown in this photo. 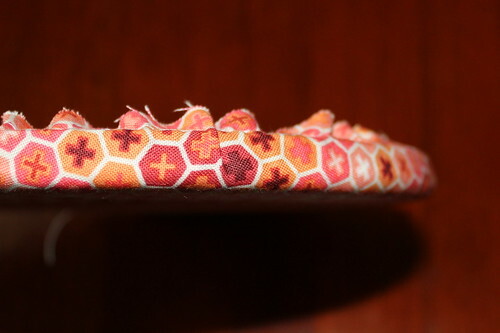 If so, you can tug a bit on the fabric gathers on the back of the board to straighten them out. Voila! A finished board, ready for hanging. To hang the boards, I used a single Command strip on each one although hot glue, liquid nail, etc. could also be used. 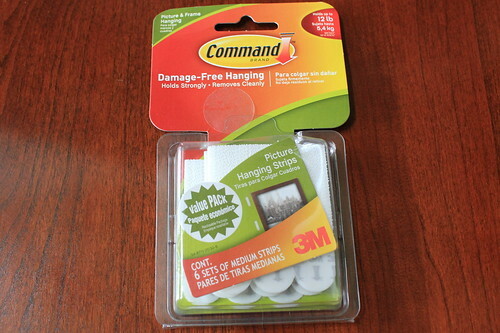 I like the fact that the Command strips will not damage my wall surface and will also allow me to remove a board to replace its cover when I tire of it or want to use the fabric for another project. I like this idea. Hopefully, this will be the last time I will see my boards unadorned; its time to start loading them up! What a great idea! I love this. I'll have to try it soon.